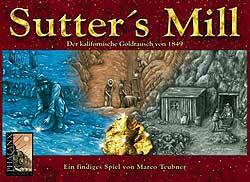 In Sutter’s Mill the players experience the sudden rise and decline of the Californian town of Coloma during the gold rush. They first build up the town, bring new citizens into it, and, last but not lease, dig gold. However, when it is time and the gold vein is almost spent, they better take their belongings and get the hell out of Colona! In the game, this is represented by a division in tow phases – build up followed by tear down. At the beginning of the game, all players start in the build up phase. It is up to the players themselves to decide when there’s no more profit to be had and to enter the tear down phase. Each player makes this choice for themselves, so while some players are already tearing down the place, others will still be building up.